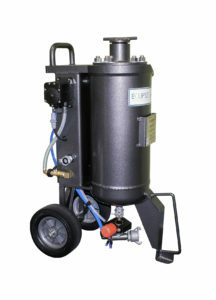 Soda Blasting Equipment | Natrium Products Inc. Soda blast pots typically come free standing, or may be part of a finished, trailer mounted system for mobile jobs. Many will allow for water attachments at the nozzle to suppress dust. Most soda blast cabinets are available in a range of sizes to suit the nature of the work pieces to be handled. Many can be customized with turn tables, or track systems to facilitate ease of maneuvering parts during operation, and some are automated.